EVERGREEN SPEEDWAY. MONROE, WA. www.evergreenspeedway.com SATURDAY & SUNDAY, NOVEMBER 12TH & 13TH. Their stock car racing program may be wrapped up for the year but that doesn't mean there's a weekend of fun waiting for you at the Evergreen Speedway. Next on the Saturday schedule is Evergreen Auto Cross. This fun form of racing allows you to race against the clock in your own car on a closed race course. The Auto Cross is open to all makes and models of cars and driver skill levels. Registration will open at 10 am. The back gate and tech opens at 1030 am followed by the mandatory driver's meeting at 1130am. The track will turn hot from 12 to 9 pm. Entry fee for drivers is $60. Pit passes are $10. On Sunday, Evergreen will present Open Drift. Drift what you drive is open to all drivers and skill levels and the event will be held come rain or shine. Driver entry fee is $60. All access pass, age 16 plus, is $15. Minors must have a parent or guardian fill out a waiver. Fans can also watch the action from the grandstands free of charge. Registration will open at 830 am, tech at 9 am and the driver's meeting at 1030 am. The track will go hot from 11 am to 6 pm. HAVASU 95 SPEEDWAY. 1/4 MILE. LAKE HAVASU CITY, AZ. www.havasu95speedway.com SATURDAY, NOVEMBER 12TH. 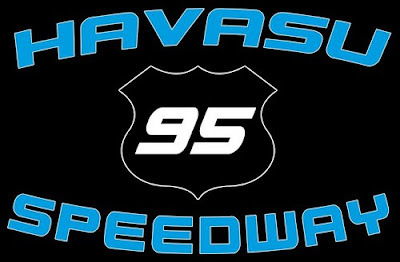 The Havasu 95 Speedway will unlock its gates this Saturday evening to present the latest round of their 2016-2017 winter racing series. This special evening is titled " Racing For Our Troops". Veterans and active duty personnel from America's armed forces will receive $2 discounts on their tickets. It's one more way for the speedway to thank our troops, past and present, for their service to our country. Saturday night will also be the start of the speedway's annual Toys 4 Tots Bicycle Drive. The ultra successful campaign in past years has raised funding in order to provide the Christmas morning surprise of a brand new bike to children from needy families, This special evening is being presented by the Mojave State Bank. The quarter mile paved oval is located within the Sara Park complex in beautiful Lake Havasu City, Arizona. The spectator gates will open at 4pm followed by racing at 6pm. This speedway specializes in good racing shows and Saturday night's race agenda is loaded with plenty of driving talent. Providing the on track action will be the speedway's Get It In Gear Street Stocks, Havasu Wiring Outlaw Karts and the Sam Nichols Electric Factory Stocks. The racing action is going to be enhanced by special two special guest divisions: the Arizona Vintage Racing Association's collection of midget and sprint cars along with the always exciting Southwest Tour Trucks. General admission adult tickets, age 17 plus, are $12. Tickets for seniors, age 55 plus, handicapped patrons and military personnel are $10 but, remember, military personnel will be entitled to the additional "Racing For Our Troops" discount. Kid's tickets, age six to 16, are $6. The speedway also offers a budget friendly family pack, priced at $25, which admits two adults and two kids. Fans can also enjoy the special amenities of the speedway's VIP section, featuring the best seats in the house, for $25. IRWINDALE EVENT CENTER. 1/8 MILE DRAG STRIP. IRWINDALE, CA. www.irwindalespeedway.com THURSDAY, NOVEMBER 10TH. Once again the Irwindale Event Center will convert a portion of their 1/2 mile oval into a 1/8th mile drag strip in order to present their NHRA Thursday Night Thunder program. The street legal drags program was created to send the message: RACE THE STRIP, AND NOT THE STREET. The program is open to all types of vehicles: from professional race cars to the car you drive to work in. NHRA Thursday Night Thunder is also budget friendly. For $20 a driver can race all night. $10 will allow spectators to watch the racing all night. The spectator gates will open at 4pm with racing from 5 to 10 pm. TUCSON SPEEDWAY. TUCSON, AZ. www.tucsonspeedwaycom. SATURDAY NOVEMBER 12TH. Tucson Speedway will be the scene of automotive bargains and exquisite classic cars during Saturday's TSRA, Tucson Street Rod Association, Swap Meet and Car Show. The event will run from 630 am to 3 pm. The event will feature automotive and motorcycle parts, antiques, toys, arts and crafts, food concessions and the car show. The event is free to buyers. For more information regarding the rental of retail booths, call Randy at 520 991 3600 or Rick at 520 484 1717. After three appearances so far this season, it's become apparent that the Get It In Gear Street Stocks are going to, once again, treat the fans to a very intense championship run similar to the championship show they presented last season. Tyler Savage won the division's season opener and backed that with a third and second place finish. That effort places him at the top of the current championship standings with 149 points. However, he's only a single point ahead of reigning champ Bobby Keirns who won the series' most recent main event. Garrett Reinoso is ranked third in the standings only six points from the leader while speedway veteran William Guevara, who won the second race of the season, is ranked fourth, nine points out of first. The Havasu Wiring Outlaw Karts' championship profile is led by driver Taylor Whitefield who has garnered a feature win along with three runner up finishes for a total of 292 points. However, Korbin Mitchell, who won the last two main events, is only four points away from the top of the championship standings. This will be two drivers to keep an eye on this Saturday night. The fan favorite Sam Nichols Electric Factory Stocks will be making their fourth appearance of the season this Saturday night. Reigning division champion Brent Delay, with a feature win, and Jeff Prieur, who has two feature wins, are the current hot shoes in this very popular series. However, Prieur's two feature wins has invoked a rather interesting set of circumstances. That would be the two win rule that was re-implemented by Promoter Bill Rozhon for the 2016-2017 winter season. The division's official rule book states: "after a car wins two races, it will no longer be eligible for first place points. If a car has already won two races and wins a third race, the car will be disqualified, (no points), and the win and the first place points will go to the 2nd place finisher and on down the finisher list. This rule applies to the car and not the driver." The Arizona Vintage Racing Association, (AVRA), is another fan favorite anytime they schedule a visit to the Havasu 95 Speedway. Headquartered at Buckeye, Arizona, this motorsports group is dedicated to the mission of ownership, racing and enjoyment of vintage race cars. These open wheels race cars are carefully preserved replicas of the midget and sprint car racers that dates back to the barnstorming days when the early racing heroes criss crossed the country appearing at dirt tracks all over America. The AVRA will also be participate in the speedway's pre race fan meet and greet. The drivers love meeting the fans while answering questions about the history of their cars. The AVRA is a total class act and extremely entertaining on the track. The Southwest Tour Trucks was formed in 2009 and is headquartered in Newberry Park, California. This high energy regional touring series spends their racing season visiting race tracks located in California, Arizona and Nevada. This show is comprised of full sized pick up trucks featuring Chevrolets, Fords, Dodge and Toyota. They raise high levels of racing entertainment at all of their appearances and are often considered to be the ultimate tail gate party. For more information regarding the winter racing season dial up their website, www.havasu95speedway.com, or visit their Facebook page.